Tom Taylor explores Laura Kinney's final battle with the Orphans of X! After being forced to reckon with the legacy of the Weapon X program, Laura Kinney joins Logan, Daken, Sabretooth, Lady Deathstrike, and Honey Badger to deal with the Orphans of X once and for all in ALL-NEW WOLVERINE #30! Written by Tom Taylor with art by Juann Cabal, the group’s healing factors have been nullified by Mursmasa weaponry, so they’ll have to do more than slice their way out of this one. Taylor joined us to discuss the end of this arc and what it’ll all mean for Laura moving forward. Marvel.com: Tom, what are you most excited to share with readers as “Orphans of X” wraps up? Tom Taylor: Honestly, I’m just happy to share this whole story. I’m really proud of this arc and especially of the team that created it. Juann Cabal and [colorist] Nolan Woodard have been firing on all cylinders on this one. Juann’s talent forced me to think outside the box in every script, and really pushed the storytelling across the board. It’s great when a creative team gels like this. It’s the kind of alchemy you can only get with comics. Marvel.com: This arc kicked off as Marvel Legacy got underway, and you’ve certainly explored that concept since. How did you come to this examination of Logan’s legacy and the “family” that has sprung up around him? 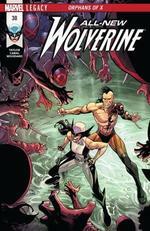 Tom Taylor: This story is about the ramifications of not just Logan’s past, but of Laura’s and Daken’s. Logan hurt a lot of people in his past, and the same is true of his children. The Orphans of X are Laura’s legacy. They’re also the legacy of Logan and Daken and Sabretooth. In a way, there’s no evil here. The Orphans of X have a genuine reason for what they’re doing. They’re almost justified in their actions. The true trick has been finding a way to end this story amidst all the shades of grey. Some Wolverine stories can’t be solved with claws alone. 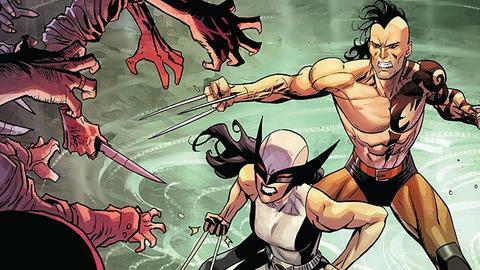 Marvel.com: Will Daken be more present in this series going forward, or will he go his own way once they handle the Orphans of X? Tom Taylor: Daken will be going his own way after “Orphans of X,” but I think we’ve seen real growth in his character with the way he’s supported Laura throughout this story; his actions in our final issue confirm this. I’m glad their relationship as brother and sister has strengthened here. It means the dynamic has changed for the future. Tom Taylor: Deadpool and Honey Badger’s unique friendship has made headlines and fans have been desperate to see them together again. I wanted to too. It’s not that Deadpool comes crashing into their lives, it’s actually that Gabby needs help—and Wade is the first person she calls. This issue is definitely one of the most fun issues of our entire run, but also has a lot of heart. My son actually read this issue earlier today and I could hear him constantly laughing from his room, which is about the best feedback you can receive. [Artist] Marco Failla and Nolan Woodard did such a perfect job with this issue, and I think a lighter story like this is good to have after our much heavier “Orphans of X” arc. After that, we get a bit of an epilogue to “Orphans of X” with [artist] Djibril Morissette-Phan returning on art for a smaller, personal story. And then, we head into the future as our epic “Old Woman Laura” story begins. Too often, we’ve seen a future to be afraid of, a post-apocalyptic wasteland where the worst of humanity took over and everything went wrong. With “Old Woman Laura,” I wanted to turn this on its head and show a bright future. A future where the heroes won…almost. Tom Taylor and artist Juann Cabal’s ALL-NEW WOLVERINE #30 is available now!